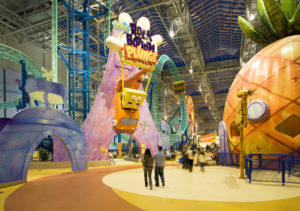 April, 2008 – Bloomington, Minnesota – Mall of America’s recently renovated Nickelodeon Universe, formerly The Park at MOA and Camp Snoopy, has opened its fun-infused walls to throngs of excited children and parents, with Krech, O’Brien, Mueller & Associates along for the ride. As the design force behind many of the retail and structural sites that were re-branded for the first-ever Nickelodeon themed park, Krech, O’Brien, Mueller & Associates was responsible for much of the amazing transformation in the seven-acre theme park. In addition to 18 new Nick-themed rides and attractions, Nickelodeon Universe also features four new Nickelodeon-branded retail stores. SpongeBob SquarePants Rock Bottom Plunge is the shortest Gerstlauer roller coaster to date, standing only 67-feet tall; yet it has a 97-degree drop. Developed by TivoliToo, a 3-dimensional sculpting and design studio, and supported by Krech, O’Brien, Mueller & Associates’ structural engineering team, it features a prominently placed statue of SpongeBob and Patrick riding an orange bus down a 90-degree angle while holding a rubber glove over his head. As for retail, located at the north entrance stands the Nickelodeon Store. Occupying more than 5,000-square feet, it is the flagship store with the largest selection of Nickelodeon merchandise in the world. It features a snow white metal façade, with large punched windows showcasing the vibrant green and orange interior. The exterior is alive in color and size, with a 15’ tall and 25’ wide sign elevated 10’ above the entry. Nickelodeon Universe will also feature 4U, a trend-setting fashion store for tweens and teens with merchandise like hot shirts and unique bags featuring some of Nick’s most popular properties, including The Naked Brothers Band and SpongeBob SquarePants. With an open ceiling system, colorfully painted interior and complimentary wood grain fixtures, the space boats a bright and breezy feel. Supporting the airy feeling, simple forms create unusual overhangs and a column colonnade reinforces the clean horizontal lines. The lively orange exterior also provides large vertical surfaces for impressive graphics. NU Stuff is home to park-based Nickelodeon Universe souvenir merchandise. 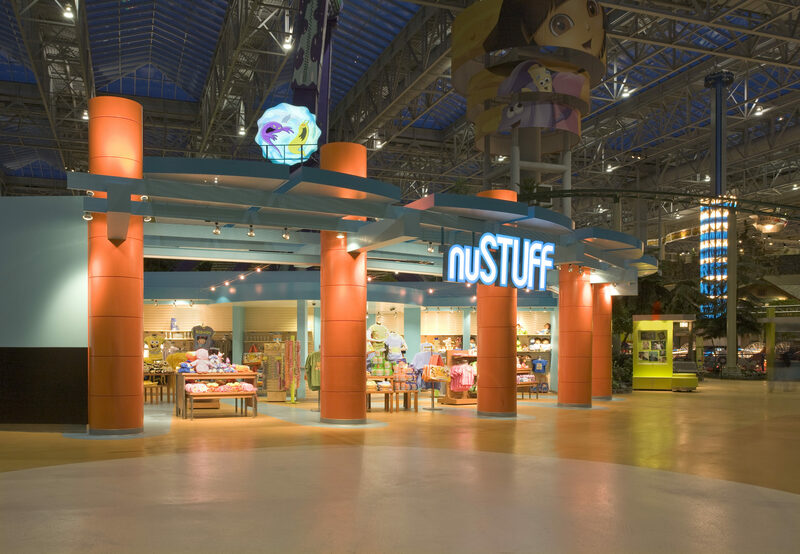 This 1,000-square foot space, located at the East entrance of Nickelodeon Universe, offers an open atmosphere to make browsing fun and easy. Redefining amusement park eating, Chicago-based Levy Restaurants is launching EATS. Levy’s innovative culinary team has created healthy dining options and one-of-a-kind concepts for guests of all ages, with the kitchen designed to allow guests to watch as their food is being prepared. Featuring a swirl in the floor that leads guests to their eating experience, the colorful tiles and clean patterns emulate the overall clean design. An extreme renovation, EATS is now a playful and brightly colored food venue.